The Hot Apple Cider 2 anthology came out. It has thirty-seven Canadian Christian writers in the book, including yours truly, writing about strengthening marriages. I would encourage you to consider obtaining a copy. The first Hot Apple Cider anthology was very well received. 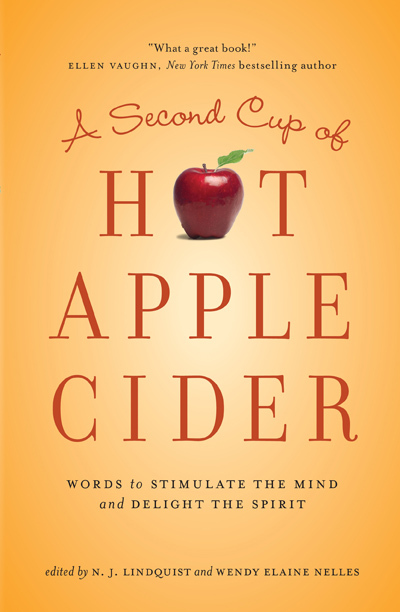 Over 45,000 copies of Hot Apple Cider 2 are being produced. You will love it. It will be an excellent gift item for both your Christian friends and seekers. Categories: Uncategorized | Tags: Angelina Fast-Vlaar, Anthology, Bonnie Grove, Brad Burke, Canada, Carmen Wittmeier, Carolyn Arends, Castle Quay Books, Christian, David Kitz, Deborah Gyapong, Denyse O'Leary, Diane Roblin-Lee, Don Ranney, Donna Carter, Donna Dawson, Donna Fawcett, Eleanor Shepherd, Ellen Vaughn, Eric Wright, Grace Fox, Hot Apple Cider, Hot Apple Cider 2, Jane Harris, Jean Chamberlain Froese, Keturah Leonforde, M.D. Meyer, Marcia Lee Laycock, Mark Buchanan, NJ Lindquist, Paul Beckingham, Paul Boge, Ray Wiseman, seekers, Sheila Wray Gregoire, That's Life! Communications, The Word Guild, Thomas Froese, W. Harold Fuller, Wendy Elaine Nelles, Wendy Nelles, Write! Canada | Permalink.